Located 6.5 miles northwest of Polson on tribal land, a rock with various inscriptions including Hershman and 1717, seen above, predates the current historical timeline of European presence in Western Montana. 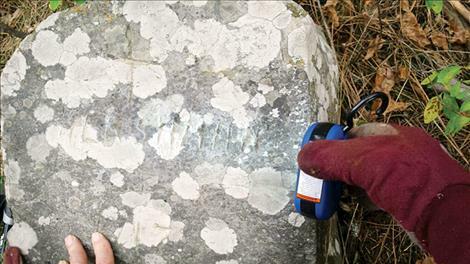 POLSON — The Hershman Rock is an enigma to area history enthusiasts. The rock, which is located in the Jette area and supposedly designates the burial place for someone who died in 1717, has been known of by various locals since a story was written about it on July 6, 1970 in the now-defunct Flathead Courier. According to that story, Ray Dupuis and a group of foresters working in the area 6.5 miles northwest of Polson found the rock in the woods on Confederated Salish and Kootenai Tribal land in 1970. Now covered with lichen, engravings on the rock are hard to read without the aid of a flashlight. Inscriptions on the rock include: Hershman, 1717, RIH, cross, star of David and a rabbit. Manley, and Lake County’s deputy civil attorney Wally Congdon, believe that RIH represents “Rest in Heaven,” while the rabbit likely represents children, and the cross and star of David are Christian symbols, the latter representing the Judeo-Christian heritage. Carl Haywood, a retired forester and amateur historian, said the rock is one of three in the area, noting others exist near Coram and Kalispell. But the Hershman Rock has the earliest date. “There’s a good possibility there were people (of European descent) moving here at that time. We just don’t know who they were,” Haywood said. “There’s not a single one at this point with historical evidence tying them to a person or group,” he said. The Coram Rock bears the inscription “J. Smith Died July 17, 1801,” according to Jaix Chaix, who wrote about it in the Flathead Beacon on June 24, 2014. The Herron Rock, found west of Kalispell in 1959, bears the date of 1744, Chaix said. Chaix, who now lives in the Tampa, Florida area, learned of the Hershman Rock while reading the notes of a fur trader named “Howse” at the University of Montana library. Howse wrote about a missionary trail that went from St. Ignatius to Canada, Chaix said. That led him to discussions with a local tribal academic who Chaix declined to reveal. But he led Chaix to the Hershman Rock. “Long before Lewis and Clark got here in 1804 we had all sorts of European folks traveling around,” Chaix said. Haywood, a Thompson Falls resident, said David Thompson wrote the first history of Europeans in the area. Thompson arrived in the area in the 1790s. Haywood said Thompson was the first European in recorded history who did fur trading in the area and that he built the Salish House trading post in 1809. Congdon, who owns a ranch in the Elmo area, theorizes that someone of European descent could’ve been in the area as early as the 1740s. “The Acadians may have put the stones there,” he said of the three that have been found in northwest Montana. The Acadians came from Nova Scotia, Newfoundland and Prince Edward Island in Canada. The British hated them because they were French, Congdon said, adding that Brits executed some Acadians and shipped others to Louisiana around 1755. A lot of the Acadians from Canada worked for Hudson’s Bay Company, he said. Hudson’s Bay Company merged with the North West Company in 1821. Explorers Alexander Mackenzie, Simon Fraser and David Thompson all worked for the North West Company, according to the Center for the Study of the Pacific Northwest. The first recorded group of Europeans to come to Montana were the Verendrye Brothers, French-Canadians who made it from Quebec to Great Falls in 1743, Congdon said. “Twenty or 30 years later (than 1717), it would be more of a possibility,” he said, referring to the Hershman Rock. Nonetheless, he said the rock may be valid. He and Manley plan to have someone from Lake County record the location of the Hershman Rock with a Geographic Information Systems (GIS) marker so that it can be given to a historian or museum and not be lost to history. Manley traveled to Minnesota to see the Kensington Runestone, and said it looks similar to the Hershman Rock. The Runestone, which was discovered in 1898, dates to 1362 and appears to be written by Vikings, according to runestonemuseum.org. “There’s a lot out there we don’t know,” Manley said.